400 Hz measurement – capture power quality measurements for avionic and military power systems. PowerWave data capture – capture fast RMS values to see every waveform so you can determine how the voltage, current and frequency values are interacting. Power inverter efficiency – measure both ac power and dc power, in and out, to monitor the efficiency of inverters. Energy monetization – calculate the fiscal cost of energy waste due to poor power quality. Energy assessment– quantify the before and after installation improvements in energy consumption to justify energy saving devices. Frontline troubleshooting – quickly diagnose problems on-screen to get your operation back online. Predictive maintenance – detect and prevent power quality issues before they cause downtime. Load studies – verify electrical system capacity before adding loads. For some users, loads switching is a cause of power quality problems. When loads switch on, the current draw sometimes causes the voltage to drop to a level that causes other equipment to malfunction. The PowerWave function available in the 435 and 437 Series II models enables users to capture voltage, current and frequency signals simultaneously at a high speed to see which interaction is potentially causing problems. PowerWave goes beyond standard power quality measurements; PowerWave’s fast data capture mode enables system dynamics to be characterized. Waveforms for voltage and current are continuously captured for the specified time, and are displayed on screen in high detail; the power waveform is derived from the data. In addition, half-cycle RMS values for voltage, current, power and frequency can be stored and retrieved for analysis. This feature is particularly useful for testing of standby generation systems and UPS systems where reliable switch-on can be vital. These UPM calculations are used to quantify the fiscal cost of energy loss caused by power quality issues. The calculations are computed, along with other facility-specific information, by an Energy Loss Calculator that ultimately determines how much money a facility loses due to wasted energy. Power inverters take DC current and transform it into AC current, or vice versa. Solar generation systems usually include an inverter that takes the DC energy from the solar cells and converts it to useful AC power. Inverters can lose performance over time and need to be checked. By comparing the input power with the output power you can determine the system efficiency. The 435 and 437 II models can measure the efficiency of such inverters by simultaneously measuring the DC and AC power of a system to determine how much power is lost in the conversion process. 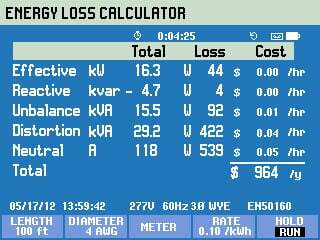 These UPM calculations are used to quantify the fiscal cost of energy loss caused by power quality issues. The calculations are computed, along with other facility-specific information by an Energy Loss Calculator that ultimately determines how much money a facility loses due to wasted energy. With a single push of a button, the unique System-Monitor gives you an overview of power system performance, and checks the compliance of incoming power to EN50160 limits or to your own custom specifications. The overview is shown on a single screen, with color-coded bars clearly indicating which parameters fall outside the limits. 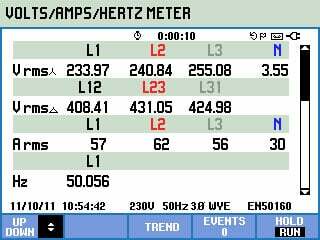 The System-Monitor overview screen gives instant insight into whether the voltage, harmonics, flicker, frequency and the number of dips and swells fall outside the set limits. A detailed list is given of all events falling outside the set limits.